« The Act Like a Girl Birthday Show!!! 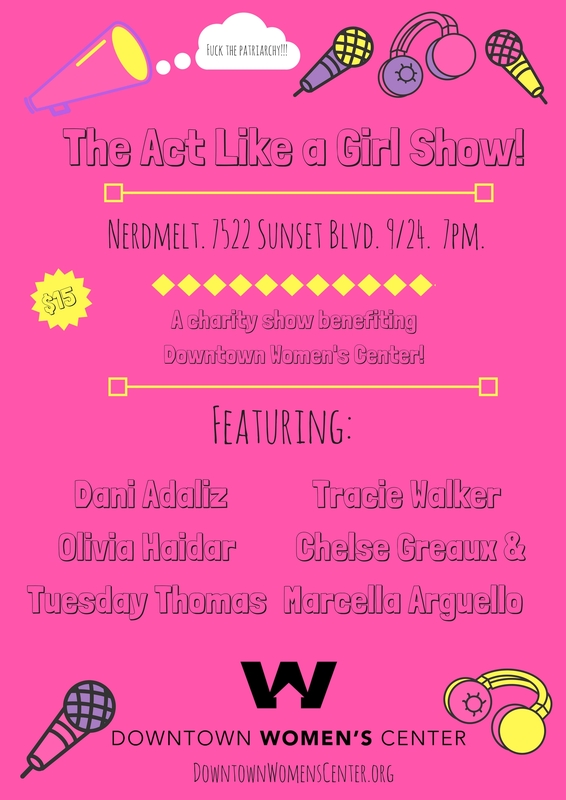 The Act Like a Girl Live Show is back! This months show is a benefit show for The Downtown Women’s Center. DWC’s mission is to provide permanent supportive housing and a safe and healthy community fostering dignity, respect, and personal stability, and to advocate ending homelessness for women. This show also features all women/non binary people who have experienced homelessness. Featuring Dani Sullivan, Olivia Haidar, Tuesday Thomas, Tracie Walker, Chelse Greaux, and Marcella Arguello! We will also have interviews with a representative from the center. Please join us for a night of education, awareness, and fun!!! Tickets are $15 and all the proceeds will be going to the center. We will also be accepting monitory donations on top of that, as well as gift cards to grocery stores, Target, etc.